Nothing’s more satisfying than making your own pile of wood. Before you start stacking those logs, get to know the basic parts of your electric chainsaw. Then learn how to safely operate and maintain your equipment. Guide bar and guide bar nose. Support and guide the saw chain. Front handle. Hold on with your left hand here. Rear handle. Hold on with your right hand here. Rear hand guard. Helps protect your right hand. Bucking spike. Help maintain a solid position when felling or bucking. Throttle lockout. Prevents the saw from starting accidentally. Motor housing. The inner workings of your saw are in here. Careful, this might get hot during use. Throttle control. Gets your saw spinning. Chain-tensioning screw. For loosening or tightening the saw chain. Chain oil cap. Chain oil goes here to lubricate the saw chain as it runs. Chain oil bulb. Press this every 10 – 30 seconds or so while cutting – helps the saw chain run smoother and prevents damage. NOW YOU KNOW YOUR CHAINSAW’S BASIC PARTS. 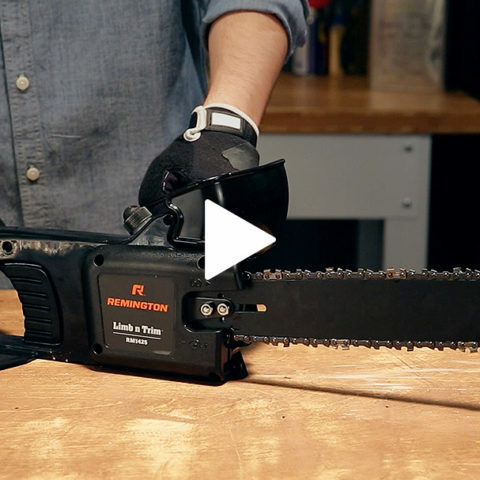 NEED ANY OTHER CHAINSAW TIPS?